Mix wheat flour and Semolina (Suji) in a hot pan. Now melt the flour in the ghee and mix it well. When it mixes well with a ghee add some milk to prepare a hard dough. Keep the dough covered for one hour. After one hour, make the dumplings of it in a shape and size of a lemon. Put the prepared dumplings in a middle of the palm of both hands and flatten them gently. Put the ghee in a pan and heat it then put the prepared dumplings in it. When it becomes golden brown from both sides, take it out on a plate and let them cool down. After this, slice these dumplings into pieces, grind them finely into a mixer and strain the Churma with the help of a strainer. When the complete Churma is prepared, then heat it with a ghee in a pan on a low flame and roast it well. After roasting, take it out in a vessel and mix Bura, cashew nuts and cardamom powder in it. Make the laddus with this mixture. 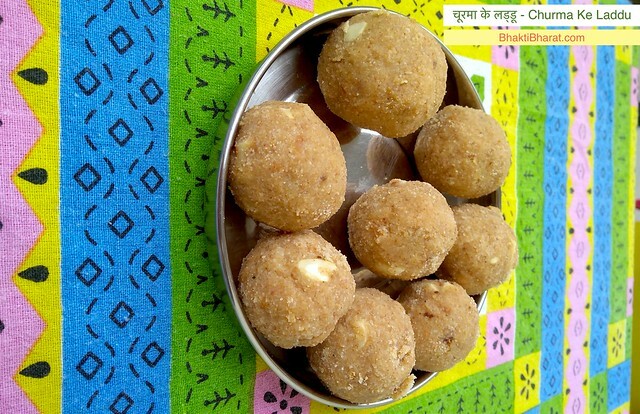 In this way, Churma Ke Laddu is ready for indulgence.